NRCS has implemented a broad spectrum of initiatives since January of 2009. These initiatives enable NRCS to more effectively address priority natural resource concerns by delivering systems of practices, primarily to the most vulnerable lands within geographic focus areas. Conservation beyond boundaries—Landscape-scale natural resource concerns, such as species conservation and water quality, cannot be treated effectively based on geo-political boundaries. 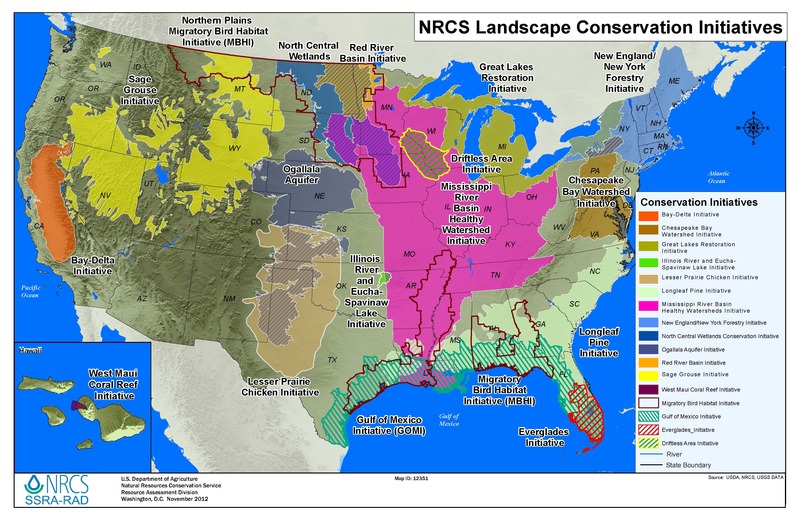 NRCS recognizes that natural resource concerns transcend farm, county, and state boundaries. A science-based approach — Findings from the multi-agency Conservation Effects Assessment Project (CEAP) indicate the most effective way to increase protection of natural resources is to target conservation to the most vulnerable or valuable areas and to apply a systems rather than a practice-by-practice approach. Within individual initiatives, the best available university and government science resources are used to define initiative targeting approaches. Build on existing locally-led efforts and partnerships — NRCS seeks to maximize the success of initiatives by leveraging partner interest and resources through programmatic and other tools. Regulatory certainty for agricultural producers — Where applicable, NRCS is working with regulators so agricultural producers can have certainty that the voluntary conservation systems they implement are consistent with current and potential regulation, as well as sustained agricultural production. the conversion rate of grasslands and wetlands. Improving water quantity and quality in the Bay Delta area of California for over 23 million people and irrigation water to four million acres of farmland. Supporting rural economies, protecting wildlife habitat and improving water quality in the Chesapeake Bay Watershed. Improving water quality, controlling invasive plant species, improving wildlife and fish habitat and supporting rural economies in the Florida Everglades region. Restoring and protecting watersheds in eight states surrounding the Great Lakes that provide drinking water for over 40 million Americans and drive a $62 billion annual economy of fishing, boating and recreational activities. Improving water quality, increasing water conservation and enhancing wildlife habitat within watersheds draining into the Gulf of Mexico in the states of Alabama, Florida, Louisiana, Mississippi and Texas. Reducing nutrients, bacteria and sediment and enhancing the economic viability of agricultural operations within the Illinois River Sub-Basin and Eucha-Spavinaw Lake Watershed of Arkansas and Oklahoma. Expanding Lesser prairie-chicken habitat and benefiting the long-term sustainability of producers’ agricultural operations in high priority habitat areas in the current range in the states of Colorado, Kansas, New Mexico, Oklahoma and Texas. Enhancing critical wildlife habitat and improving the health, sustainability and profitability of privately owned Longleaf pine forests in the southeastern United States. Providing food, water and critical habitat for bird populations, supporting local economies by attracting hunters and bird watchers, and expanding opportunities for improved wildlife management. Improving water quality, restoring wetlands, and enhancing wildlife habitat and agricultural profitability in priority small watersheds of the Mississippi River in the states of Arkansas, Kentucky, Illinois, Indiana, Iowa, Louisiana, Minnesota, Mississippi, Missouri, Ohio, Tennessee, South Dakota, and Wisconsin. Helping keep forests as forests in the New England region that provide clean drinking water, support rural economies and protect wildlife habitat. Targeting soil erosion and wildlife habitat to restore critical and rare habitat, increase grassland acreage and improve water quality in the four-state Driftless Area. Reducing aquifer water use, improving water quality and enhancing the economic viability of croplands and rangelands in Colorado, Kansas, Oklahoma, Nebraska, New Mexico, Texas, South Dakota and Wyoming. Decreasing water quantity flowing into the Red River and its tributaries to reduce flooding potential, increasing water quality, and restoring wildlife habitat for migratory species. Conserving Greater sage-grouse population by restoring its habitat and improving the productivity of ranching operations in 11 western states. Reducing pollution to improve coastal water quality and coral reef ecosystem health in the Ka’anapali-Kahekili watershed of Hawaii.